WASHINGTON (AP) — A Supreme Court deeply split over abortion wrestled Wednesday with widely replicated Texas regulations that could drastically cut the number of abortion clinics in the state. As ever, Justice Anthony Kennedy appeared to hold the outcome in his hands on a court operating with eight justices since the death of Justice Antonin Scalia. The court's most significant abortion case since the early 1990s crackled with intensity during 85 minutes of pointed questions from liberal and conservative justices that suggested little common ground in resolving the clinics' claim that the regulations are medically unnecessary and unconstitutionally limit a woman's right to an abortion. Texas says it is trying to protect women's health in rules that require doctors who perform abortions to have admitting privileges at nearby hospitals and force clinics to meet hospital-like standards for outpatient surgery. The rules would cut the number of abortion clinics in the state by three-fourths, abortion providers say. The three women justices and Justice Stephen Breyer repeatedly questioned why Texas needed to enact the 2013 law. "But what is the legitimate interest in protecting their health? What evidence is there that under the prior law, the prior law was not sufficiently protective of the women's health?" Ginsburg asked Texas Solicitor General Scott Keller. More than 210 women are hospitalized annually as a result of complications from abortions, Keller said. 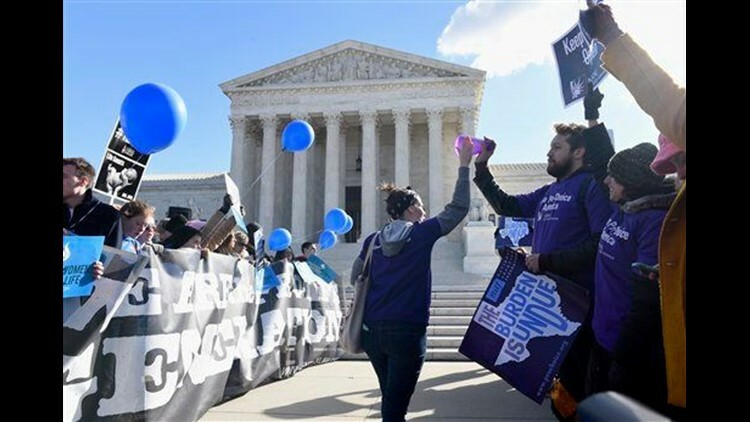 Pressed by Ginsburg, Keller acknowledged that was a relatively small complication rate but said the state still could act to make abortion safer. With about 70,000 abortions a year in Texas, that works out to a rate of less than one-half of 1 percent. Justices Elena Kagan, Sonia Sotomayor and Breyer all pointed out that other procedures, including liposuctions, colonoscopies and dental surgeries, have higher complication rates and yet can be performed in facilities that do not meet the stringent standards. The clinics, backed by the Obama administration, argue that the regulations already have closed half the roughly 40 clinics that existed before the law was enacted and that only about 10 clinics would remain if it is allowed to take full effect. The high court, again divided between liberals and conservatives, has blocked the surgical center requirement from taking effect. Solicitor General Donald Verrilli Jr. urged the court to offer a new endorsement of the abortion right it last affirmed in 1992. "If that right still does retain real substance, then this law cannot stand. The burdens it imposes, the obstacles, are far beyond anything that this Court has countenanced. And the justification for it is far weaker than anything that this Court has countenanced," Verrilli said. Chief Justice John Roberts and Justice Samuel Alito pressed the lawyer for the clinics, Stephanie Toti, to cite evidence showing that the regulations have had the drastic effect she claimed. Both Alito and Roberts questioned whether some clinics closed for reasons independent of the regulations. Even with the outspoken abortion rights opponent Scalia on the court, Kennedy would have held the decisive vote. He provided the margin of victory in the 1992 case that bolstered the abortionright the court declared in Roe v. Wade in 1973. He wrote the majority opinion in another 5-4 case in 2007 that upheld a federal ban on the procedure known as partial-birth abortion. Kennedy's questions Wednesday did not make clear where he is headed. But he holds the key to whether the court splits 4-4, a result that would leave the regulations in place, but not resolve the issue nationally. He could side with his four more liberal colleagues to rule for the clinics and roll back the regulations. Kennedy also suggested another outcome that would in essence put the issue on hold for a time to see whether the remaining clinics in Texas are able to accommodate the demand for abortionin the nation's second-most-populous state. Kennedy appeared concerned that one effect of the 2013 Texas law is that it has lowered the number of abortions resulting from women taking pills and increased the number of more invasive surgical abortions, which he said "may not be medically wise." The hearing took place in the middle of a raucous presidential campaign, and the scene outside the court on Wednesday had the feel of a campaign rally. Dozens of anti-abortion protesters chanted "pro-life, pro-woman" while hundreds of abortion rights advocates nearby shouted "abortion is a human right." House Speaker Paul Ryan, R-Wis., showed up at one point and briefly addressed the abortion opponents. "We are the pro-life movement that is here to stand up for the women. We are here to stand up for the unborn and we are here to stand up for the rule of law," Ryan said.